2011. Winner. The first César for Best Animated Film of 2010 went to The Illusionist, directed by Sylvain Chomet from a finished but unfilmed screenplay by Jacques Tati, the 20th-century master filmmaker and comedian. The film, in pantomime, is about an elderly stage magician who is forced to recognize that he has become outdated and a has-been. Tati never filmed it because he considered it to be too downbeat and melancholy for the public. The reviewers felt that the animated film was beautiful, but they agreed that “sad” and “melancholy” best fit its mood. Nominated. The other two 2011 nominees were Arthur et la Guerre des Deux Mondes (Arthur 3: The War of Two Worlds) and Une Vie de Chat (A Cat in Paris). 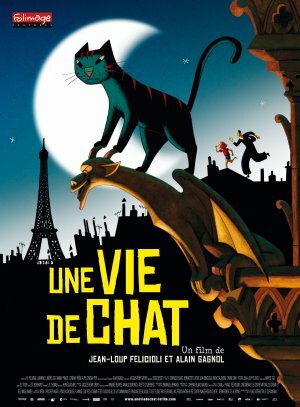 Neither featured anthropomorphic animals, although A Cat in Paris prominently featured a cat who prowled Paris’ rooftops at night. 2012. Winner. 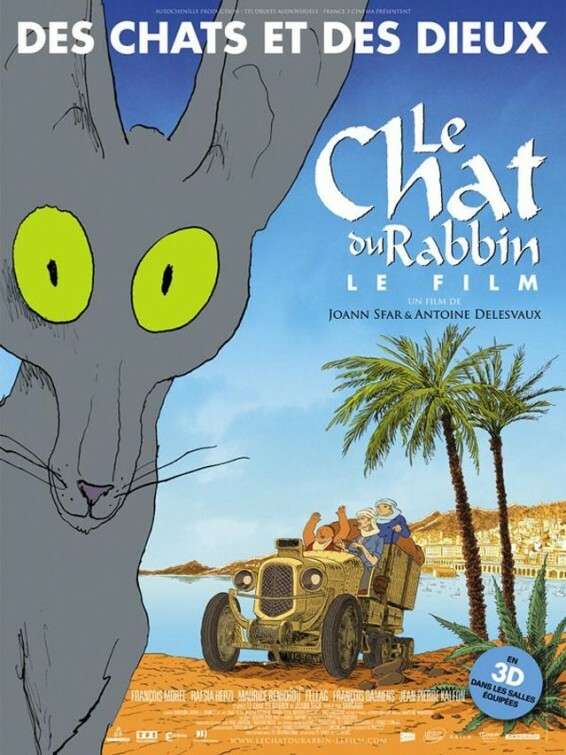 Le Chat du Rabbin (The Rabbi’s Cat), directed by Joann Sfar and Antoine Delesvaux, from Sfar’s bande dessinée. The nameless cat belongs to Rabbi Sfar, in Algiers in the 1920s. The cat, who is in love with the Rabbi’s voluptuous daughter Zlabiya, eats a parrot and becomes able to talk. He has long arguments with the rabbi, generally rejecting Jewish doctrinism for modern science. Despite this, the cat wants a bar mitzvah. He finally joins a half-dozen Jewish holy men and secular refugees from the Russian revolution who go charging across North Africa in an old half-track, looking for the Lost Tribes of Israel. Bizarre and sardonic, but very funny. Nominated. Un Monstre à Paris (A Monster in Paris) and Le Tableau (The Painting). The former is a lighthearted pastiche of The Phantom of the Opera, with a good-guy disguised giant flea replacing the Phantom. Lucille, a French chanteuse; Raoul, an inventor; and Emile, a movie projectionist, try to save Francoeur the flea from Victor, a ruthless police superintendent who knows Francoeur is harmless but who plots to frame him as a monster for his political advancement. 2013. Winner. Ernest & Célestine, directed by Stéphane Aubier, Vincent Patar, and Benjamin Renner. A French-Belgian-Luxembourgeois coproduction. Célestine is a mouse and Ernest is a bear. They live in a country where the bears live aboveground, and the mice live underneath it. The two never mix and are scared of each other, until Célestine and Ernest meet by accident, are forced to become an “Odd Couple”, and gradually develop a real friendship, to the horror of their communities. 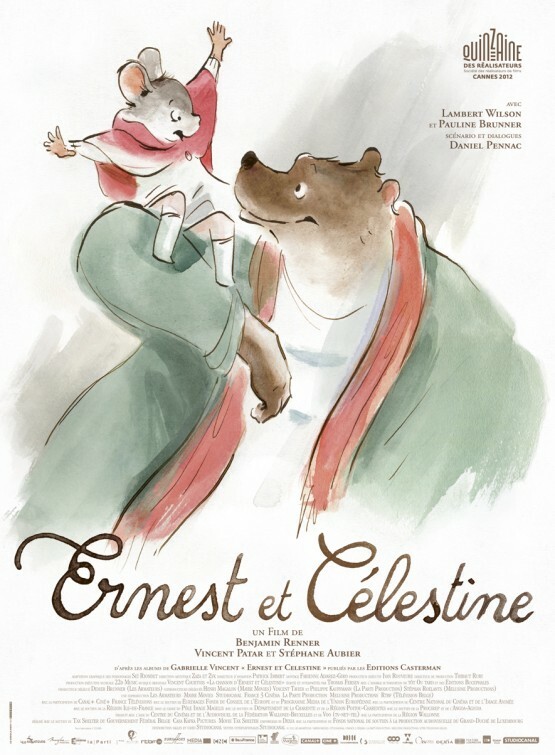 In addition to winning the César, Ernest & Célestine was nominated for both America’s Annie and Oscar Awards, and it won the Magritte Award for Best Film, for the best Belgian film of the year, animated or live-action. Nominated. 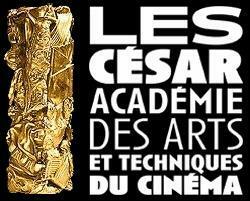 The other two César nominees were Kirikou et les Hommes et les Femmes (Kirikou and the Men and the Women) and Zarafa. Neither were anthropomorphic, although Zarafa featured a giraffe. 2014. Winner. 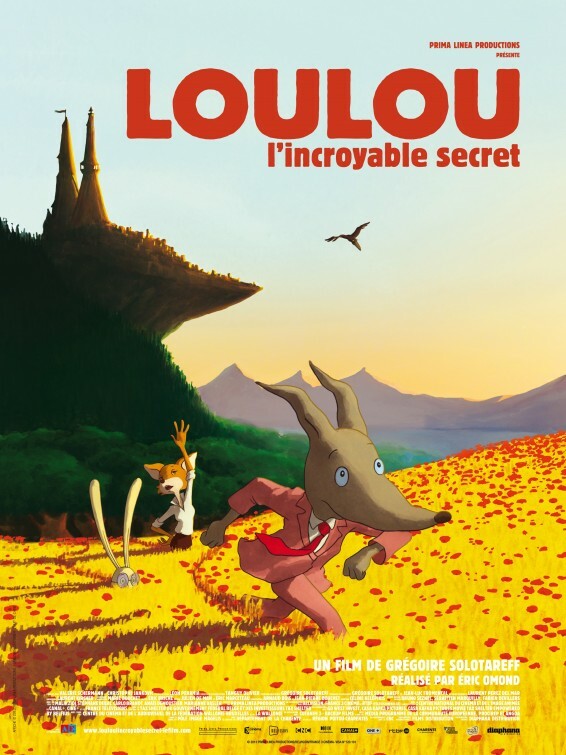 Loulou, le Incroyable Secret (Wolfy, the Incredible Secret), directed by Éric Omond. Wolfy, a teenaged wolf cub, lives with his best friend, Tom the rabbit, with the latter’s family in the Land of Rabbits. A wandering gypsy tells Wolfy that he is not an orphan as he has always thought; his mother is Princess Olympie of Wolfenberg. Wolfy and Tom go there to find her. They arrive during the Meat-Eaters’ Festival, where everyone assumes that Wolfy has brought Tom to add to the menu. Their true friendship is tested when Wolfy learns that he can become the crown prince of Wolfenberg and live in luxury, if he will give up Tom and start eating meat. Nominated. The other two nominees were Ma Maman est en Amérique, Elle a Rencontré Buffalo Bill (My Mommy is in America, She Met Buffalo Bill) and Aya de Yopougon. Neither were anthropomorphic. 2015. Winner. 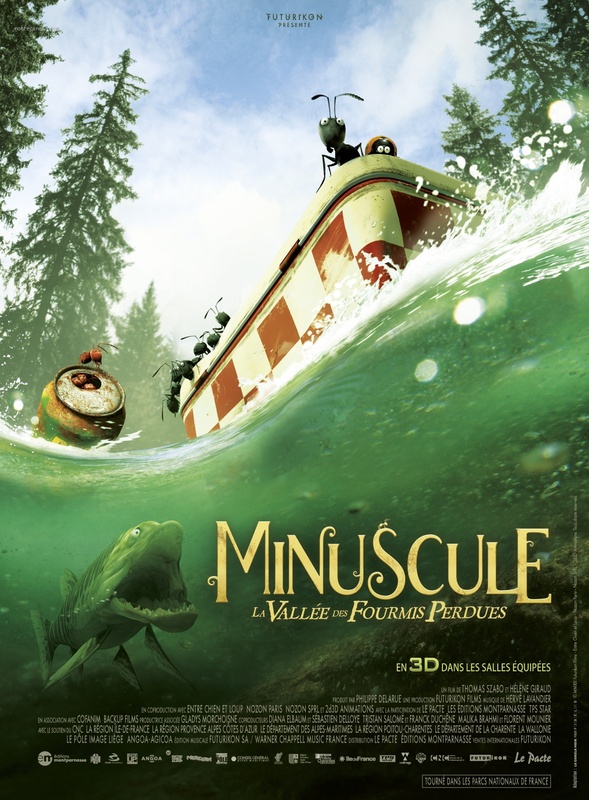 Minuscule – La Vallée des Fourmis Perdues (Minuscule – The Valley of the Lost Ants), directed by Thomas Szabo & Hélène Giraud. The first winner or nominee in CGI rather than hand-drawn animation, and in pantomime. Based upon the TV series. A married couple having a countryside picnic abandons it when the pregnant wife goes into labor and is rushed to the hospital. A work column of black ants finds it with a box full of sugar, and takes the box home despite being attacked by aggressive red ants. The red ants besiege the black ant nest, leading to full-scale warfare with rockets and catapults. A ladybug friend of the black ants goes for help on a French banknote turned into a paper airplane. Nominated. The other two nominees were Jack et la Mécanique du Coeur (Jack and the Cuckoo-Clock Heart) and the first non-French nominee, the Irish Song of the Sea. Neither were anthropomorphic, unless you consider Song of the Sea to be anthropomorphic because it features selkies; women who turn into seals when they don sealskins. 2016. It is too early to tell what will be the winner and nominees for the best animated film released in France during 2015, but it is almost guaranteed to be anthropomorphic because all of the French animated films announced for 2015 so far are anthropomorphic. Les Moomins sur la Riviera (Moomins on the Riviera) is about Tove Jansson’s hippopotamus-like Moomintrolls vacationing on the French Riviera. Yellowbird has an all-bird cast except for one ladybug. Mune, le Gardien de la Lune features a young blue faun-like creature and a girl made of wax. The least anthropomorphic is Le Petit Prince (The Little Prince), an adaptation of Antoine de Saint-Exupéry’s classic novella in a combination of stop-motion animation and CGI. All of the main characters are human, but unless the filmmakers change the plot considerably, the Little Prince should meet a talking snake, flower, and fox during his journey. Not sure if anyone is actually going to read this, but……… I liked Yellowbird a lot. At first I thought it was a disposable kiddie flick with a celebrity voice actor, but as I kept watching I discovered that it was nothing of the sort. It was a legitimately good movie, with the only flaw being a “dramatic” song used in the middle; cheesy in a way I didn’t like. But I liked how it ended, I liked the story, I liked the dialogue, and I loved the look, which was by the same guy who worked on Ernest et Celestine. I liked “Yellowbird” right up to the ending. What was that Italian passenger airplane doing at the North Pole, or wherever? And did you get the impression that the Ladybug is supposed to be a ghost from about halfway on? That was a nice touch, but I missed whatever/whenever she becomes a spirit guide. More French animated features scheduled for 2015 have been announced, and some look like potential César Award nominees or winners but they aren’t furry. If the s-f “April and the Extraordinary World” becomes a 2015 release, it may become the frontrunner. Ironically, Illumination’s “Minions” is officially an American animated feature, but while Illumination’s head/business office is in Hollywood, its animation studio is in Paris. To answer you, that was not the North Pole, nor was it ever said to be in the film. It was a non-descriptive northern location, probably northern Norway. It could even be Svalbard. What was an italian plane doing there? Most of europeans trade with each other left and right, and it is very common to have a plane from the south deliver fruits and vegetables to the north. And I am astounded you did not get the Empire Strikes Back reference. Ladybug = Obi-Wan.